My first degrees were in Classical (Greek and Roman) archaeology. I studied at King’s College, which is part of the University of London. Much of my undergraduate degree was spent in the British Museum looking at material culture from Greece and Rome, and this training played an important part in my subsequent decision to work in museums, to focus my research on archaeological material and what it could tell us about the past. Out of all of the categories of objects that I have studied, I have always had a preference for sculpture, irrespective of its culture of origin. I was recently asked if early Greek statuary had been influenced by Kemite sculpture. My response, because I was taught this when I did those first degrees, was that yes- there was no question that that the Greeks had been influenced by the statues they had seen in Egypt. 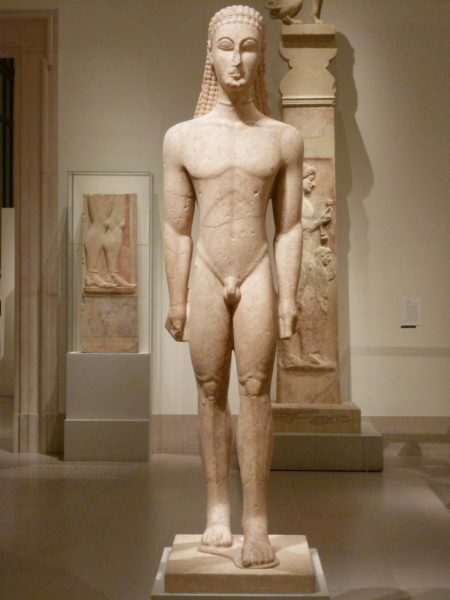 Two types of figure are represented in early life-size Greek sculpture: Kouroi (singular kouros) and Korai (singular Kore). These words mean youth/boy and girl in ancient Greek, and these statues functioned as votive offerings or funerary markers. One of the earliest fully preserved is now housed in the Metropolitan Museum of Art, New York (below). Believed to be from Attica, it dates from around 600-590 BCE and has a number of features in common with statuary from Kemet. The statue strides forward onto its left leg. The hands are clenched at the sides. 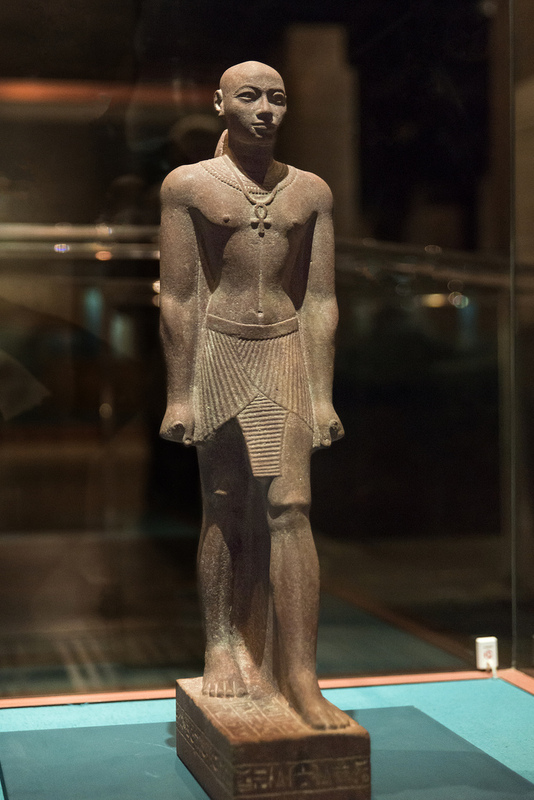 The proportions are similar to statues that were produced in Kemet during during the seventh century BCE. 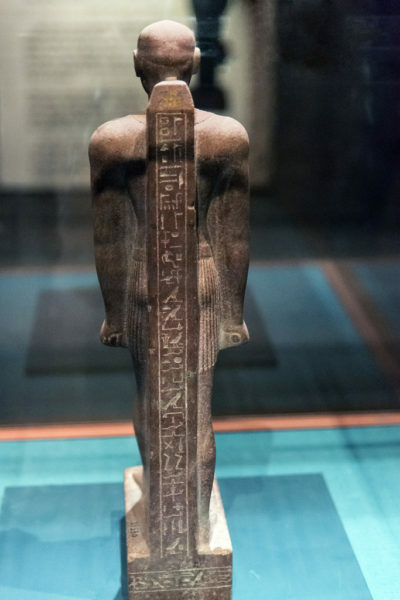 Statue representing Mentuemhet, around 650 BCE. The statue on the left represents an Kemite official named Mentuemhat, who lived around the time the Twenty-sixth and Twenty-fifth dynasties. He was a priest of Amun. The proportions of Kemite sculpture changed depending on the period that it was made. We know that artists used a grid system on a block of stone to ensure that the correct proportions were adhered to. You can see on this statue the striding stance and fists that early Greek sculptors copied. There were differences, as would be expected when one culture is influenced by another: Greek statues do not have a back pillar (see below) a feature of all striding Kemite statues, which was often inscribed. Also, the Greek statue is naked. This is not something that is found in Kemite sculpture. Mentuemhet, wears a kilt on the statue here. Back pillar of the statue of Horemakhet. Nubia Museum Aswan. (The front of the statue can be seen at the top of this post). Studies have shown that Greek sculpture was also created on a grid system, and that the proportions are similar to those on Kemite sculpture dating to the seventh century BCE. There is also the more practical question of contact and alternative influences. Prior to the appearance of the life-size kouros figures, Greek sculpture had only been produced on a much smaller scale. Some scholars (R.M. Cook for example) have tried to argue that the striding stance and clenched fists are coincidental. The transfer of artistic style from one culture to another is rarely coincidental and we have no evidence for this pose prior to the Greeks having contact with Egypt. And when making associations it is of course essential that contact and influence was possible. There was considerable contact between the two cultures during the 26th Dynasty (664-525 BC) in the form of Greek mercenaries and later colonists, at sites such as Naukratis in the Delta. Around the same time that the new sculptural style emerged in Greece. Some scholars have suggested that Greek sculptors were influenced by statues from the Ancient Near East. 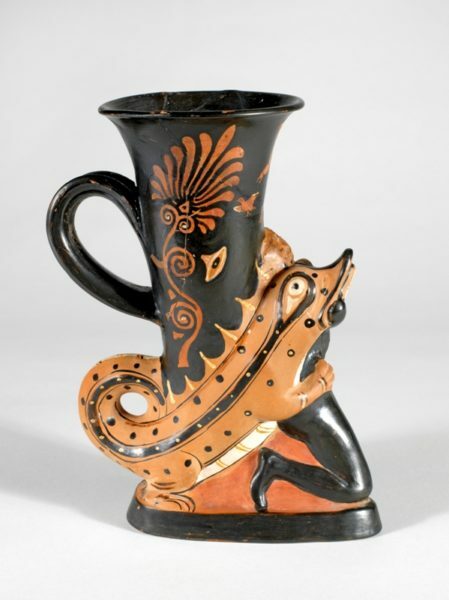 There is influence on some Greek art, from this region, perhaps most notably on pottery and small scale figures. However, there are no close parallels for the early statues. 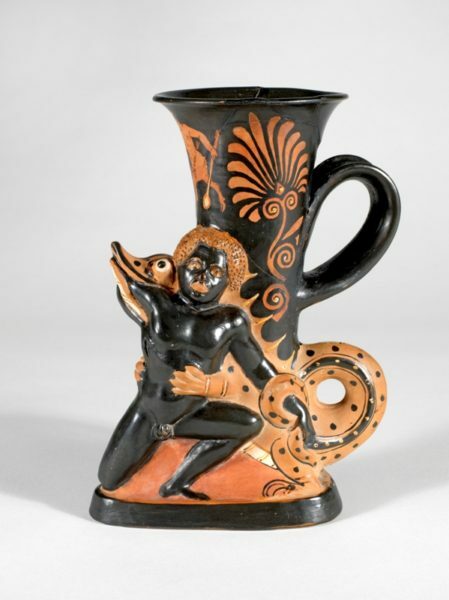 Greek artists adopted and then adapted a style of Kemite sculpture for their own cultural needs. Even during the early phases of its development there were regional differences that were found throughout the Greek world. In many respects, and this was a conclusion that I made based on my doctoral thesis, Kemite artists were much more skilled at incorporating outside influences onto their sculpture, whether it was a portrait or costume. This is not something that Greek and Roman sculptors did. Perhaps because they didn’t have thousands of years of a sculptural tradition. Rhyton, crocodile and black male. Red-figured, height 0.222 m, width 0.14 m, depth 0.10 m. Classical Period, circa 350 B.C. For the ancient Greeks and Romans their contemporaries in Egypt were different. This is evidenced through descriptions of people from Kemet and also how both Greek and Roman artists depicted people from Africa. The rhyton above is a case in point. 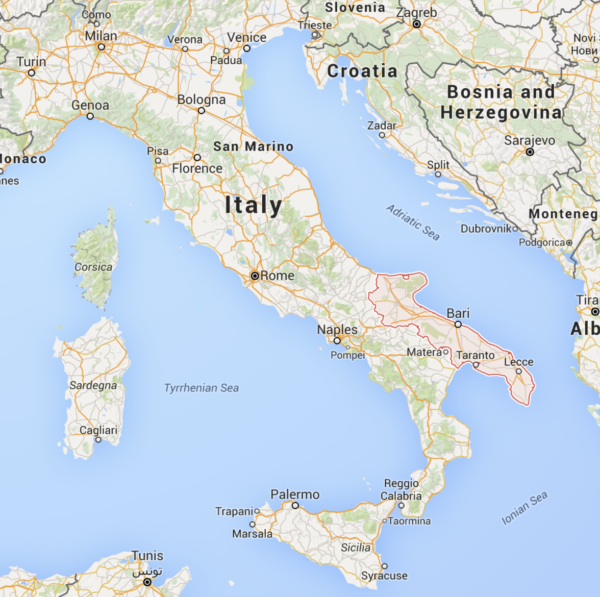 This drinking cup was manufactured in the Italian region of Apulia (below highlighted in red), which was home to colonies of Greek people. For some of the Egyptians the crocodiles are sacred animals, and for others not so, but they treat them on the contrary as enemies: those however who dwell about Thebes and about the lake of Moiris hold them to be most sacred, and each of these two peoples keeps one crocodile selected from the whole number, which has been trained to tameness, and they put hanging ornaments of molten stone and of gold into the ears of these and anklets round the front feet, and they give them food appointed and victims of sacrifices and treat them as well as possible while they live, and after they are dead they bury them in sacred tombs, embalming them: but those who dwell about the city of Elephantine even eat them, not holding them to be sacred. They are called not crocodiles but champsai, and the Ionians gave them the name of crocodile, comparing their form to that of the crocodiles (lizards) which appear in their country in the stone walls. The crocodile became synonymous with Egypt for Greek and later Roman artists and there are both vases and stone sculptures that depict humans who look very similar to the one illustrated here, accompanied by crocodiles. It is also true if we look at text references to Egypt or Egyptians, that Greek writers saw no real difference between those people from Egypt and those from Ethiopia. In fact the Greek word Aethiops, from which Ethiopian derives, means ‘burnt face‘, presumably because the Greeks who encountered African people saw them as different to themselves. Many readers will be familiar with another quote from Herodotus (Histories 2:104) that makes reference to the appearance of the people of Kemet having dark skin (melanchroes) and curly (often translated as ‘woolly‘ on account of the word ‘oleos’. * this is the term that is used in the commentary, it is not one that I condone or would choose to use. Once again we find ourselves back to the supposition that every person of African descent has (literally) skin that is black in colour, rather than acknowledging that African peoples have, and are today described as, light skinned, dark skinned, and in the case of the Caribbean red skinned (although this means very light). See an earlier post where I discuss how Egyptologists are keen to differentiate between Egyptian/Kemite and Nubian/Kushite people. The use of a term to describe the hair that includes the word for wool would suggest that the hair of the ancient Egyptian people was textured and different from that of the Greeks. The reference to dark skin also accords with representations such as the vase above. The artists’ representations for me speak for themselves. I would not classify myself as a philologist but I did study Ancient Greek for my first degree. The fact that the term melanchroes covers a variety of dark skin colours as pointed out by Lloyd, supports that argument that the people of ancient Kemet were indigenous African people, and that they represented the variance that we find amongst African peoples today.